The 5K Run/Walk is an event for all. Race to win or simply walk the course. A range of awards will be presented from fastest times, biggest corporate team and wildest socks. Multiple Advertsing Channels - The 5K Run/Walk is an event with multiple high impact advertising features designed to highlight your brand, promote good health and build fellowship outside of the conference. High End Event Production - The Run/Walk features all the bells and whistles of any great running race. This includes, professionally timed race, branded bibs, start and finish truss, awards in twelve age and male/female categories, not to mention the award for longest traveled, biggest corporate team, the most fantastic socks and oldest runner. An aerobics instructor will warm up the runners; water and athletic energy snacks will greet your runners when they finish. The post race awards ceremony will include a high profile speaking and photo opportunity for your company. 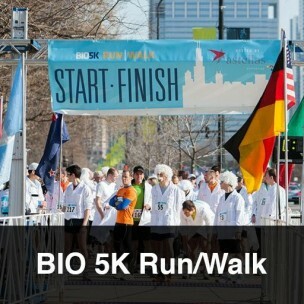 This Promotion Includes - 350 runners, Timed race, Post race snacks and drinks, Awards ceremony speaking opportunity, Branding on pre-race confirmation notices, Branding on hotel lobby bus pick-up signs, Branded start/finish banner, Branded bib numbers, Branded on-course mile marker signs, busing, M/C and Awards.